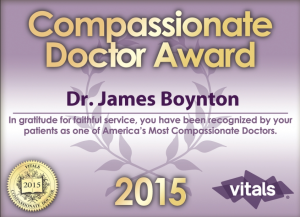 We are thrilled to announce that Dr. James F. Boynton has been honored with a Vitals Compassionate Doctor Award for 2015! This prestigious recognition identifies physicians who treat their patients with supreme kindness and sensitivity, as demonstrated by their optimal “Overall” and “Bedside Manner” patient ratings on Vitals.com – a trusted online resource that compiles patient reviews based on various aspects of care in an effort to connect the country’s top healthcare professionals with men and women interested in specific medical care. Committed to making sure every patient feels as comfortable, relaxed, and informed as possible throughout the entirety of their cosmetic treatment, Dr. Boynton is truly appreciative of the award and thankful to know his efforts are making a positive impact. He is aware that having a strong and trusting relationship with one’s doctor is essential to achieving a successful outcome for many patients, and he will continue to make excellent bedside manner a focal point of his practice. If you are considering surgical or non-surgical aesthetic enhancement, Dr. Boynton would be more than happy to meet with you to determine the most appropriate option for your unique needs and goals. To schedule a consultation, please contact us today.